The Spotzi GIS app brings professional location data functionalities to the Spotzi Mapbuilder. This powerful addon enables users with a map buffer tool to create a radius map. It also has a select functionality you are able to select multiple map features and to style your selection the way you like. Buffer functionality: The buffer functionality allows you to create a radius around a point, line or polygon. In combination with our Filter app you can also find all map features within that buffer. For example if you want to filter only ZIP code areas in a certain radius. Select functionality: With the select functionality you are able to select multiple points, lines or polygons. You just have to create a polygon and the Spotzi Mapbuilder will automatically select all the map features that are located within that polygon. After creating your selection you are able to style your selection the way you like. The apps from our Premium plan offer extra functionalities for users that want to analyze their data. The apps in this plan are also very suitable for data integration with other systems. Filter out areas that match all your characteristics within a few clicks. 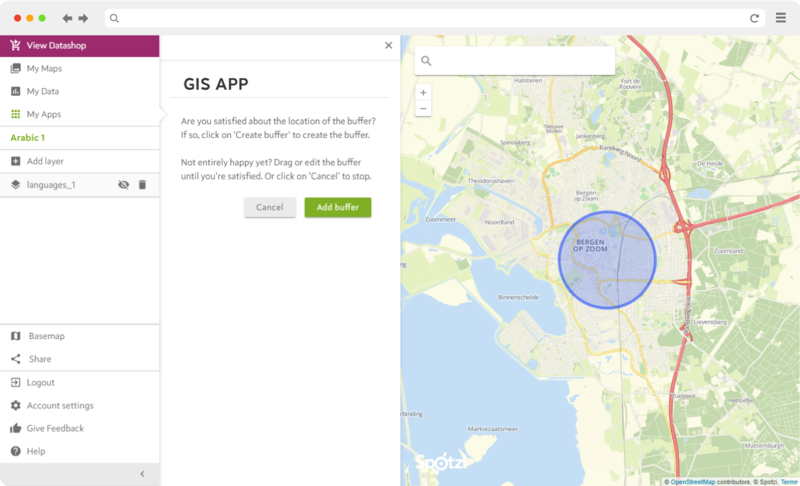 The Spotzi GIS app brings professional location data functionalities to the Spotzi Mapbuilder. The apps from our Enterprise plan offer extra functionalities for users that want take the analysis of data to the next level. The apps in this plan are ideal for marketing purposes. Turn your map into a powerful location data dashboard. Or why not try our Mapbuilder software for free first?